I mean beyond my fear of balloons (also known as “globophobia” – which means I am not alone!). And okay, I’m also overlooking the rage incited within me when somebody confuses the words “flavor” and “scent.” Yeah, let that one marinate for a minute..it’s maddening! The issue I’m talking about is my love for all things buffalo-flavored. You’d think I would have fun out of buffalo inspired recipes by now. You, my dear friend, would be wrong. I also have an obsession with potato skins. I love potatoes in pretty much every form – but roasted until crispy and topped with cheese and bacon? Right, no words needed. Clearly, not exactly the healthiest of choices – but in my defense, I usually order this “appetizer” as a main meal. I’ll be debating my selection and the husband will look up from his menu and be like “You’re ordering potato skins aren’t you?” Yes, over that delicious famous local burger or yummy spicy hot wings. Over hot wings people – that speaks volumes, does it not? Well, I have finally found a way to combine my two loves – and the best part is that this recipe is healthy for either a main meal or a snack! It’s the perfect thing to enjoy while watching college football this weekend – or to snack on next week when you’re burnt out on turkey! 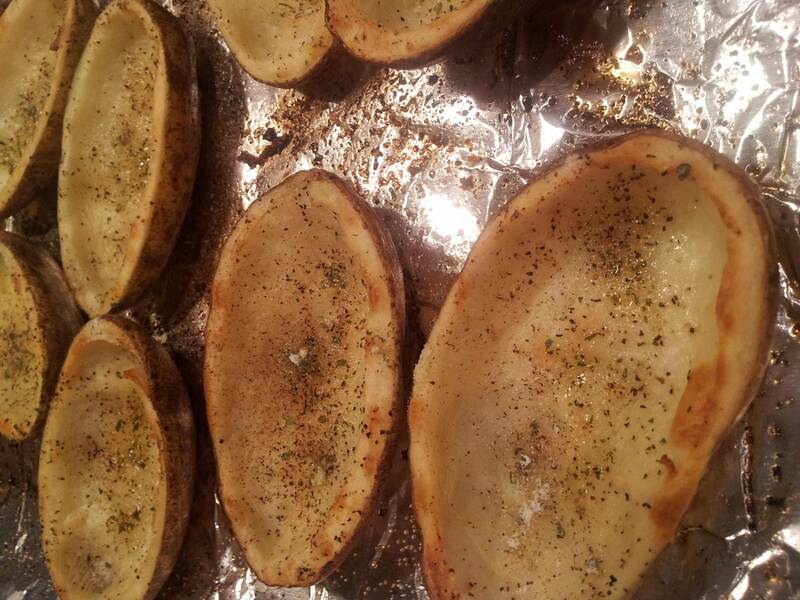 Slice all of your potatoes in half. This will give you 12 halves. See? Math is fun! Now scoop out the insides of your potatoes, leaving about 1/4 inch border to hold your filling and well, allow you to taste the potato. 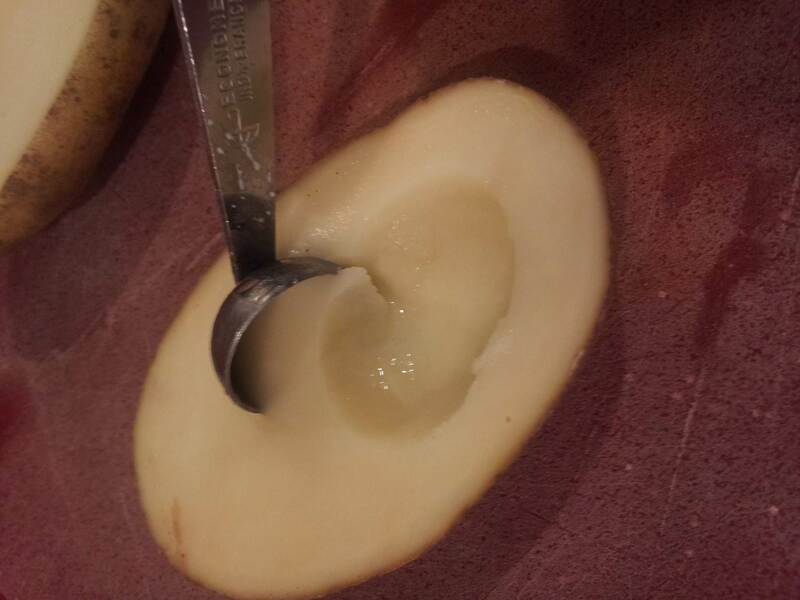 I used a melon baller to scoop since the potatoes are still raw. 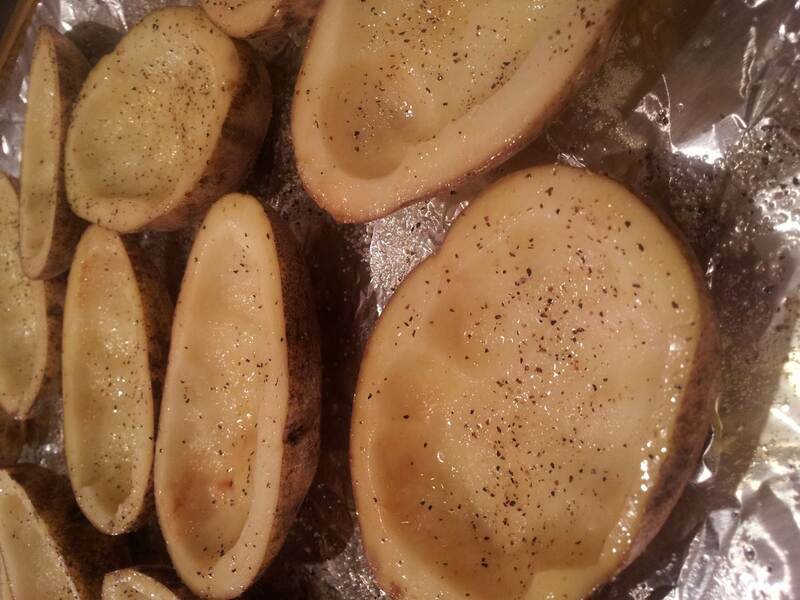 Spray both sides of your potatoes with olive oil. Sprinkle both sides with salt and pepper. I sprinkled a little Ranch seasoning on the inside to give it a little extra boost of flavor – yum! Place skins on a lightly greased baking sheet and bake for 15-20 minutes until the potato flesh is tender and the skins are slightly crispy. While the potatoes are cooking, bring a pot of water to a boil and add your chicken. 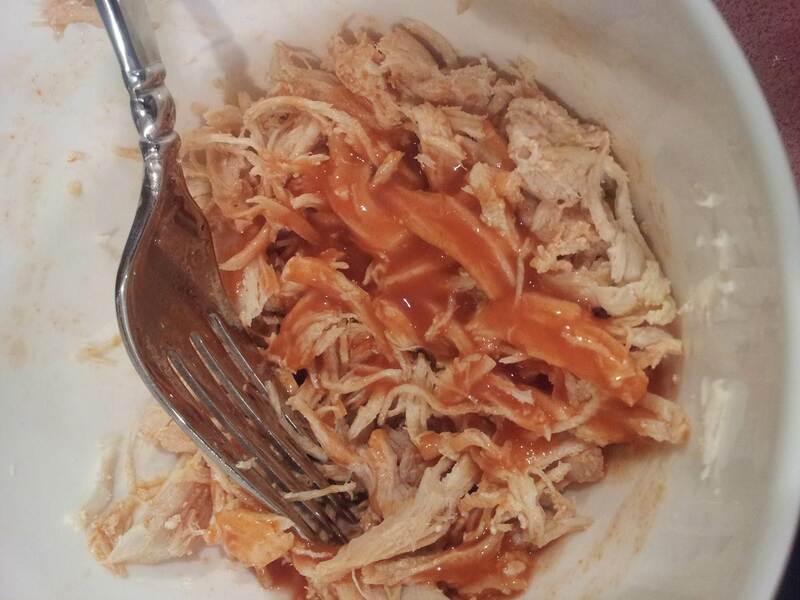 When chicken is cooked (8-10 minutes is good) let chicken cool slightly and shred with 2 forks. Add about 2-3 Tbsp. hot sauce and mix well. 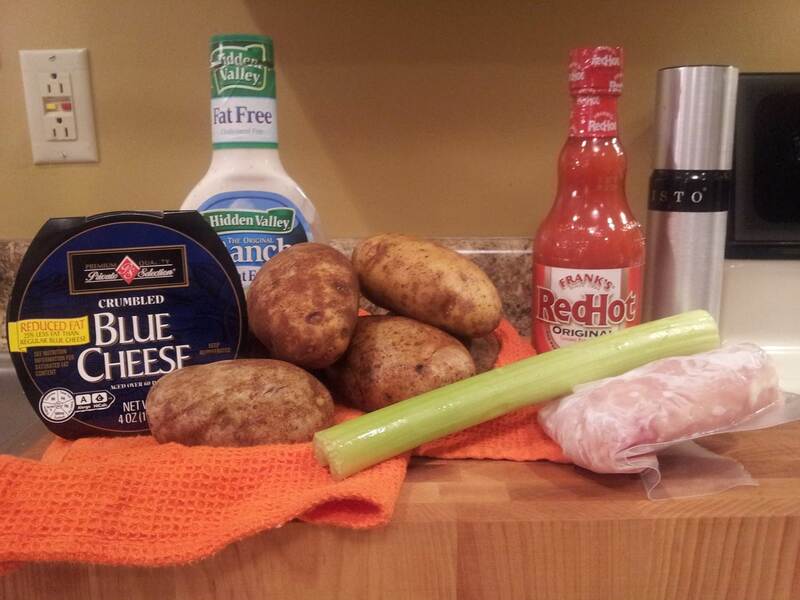 When your potato skins are cooked, remove from the oven and begin to assemble! 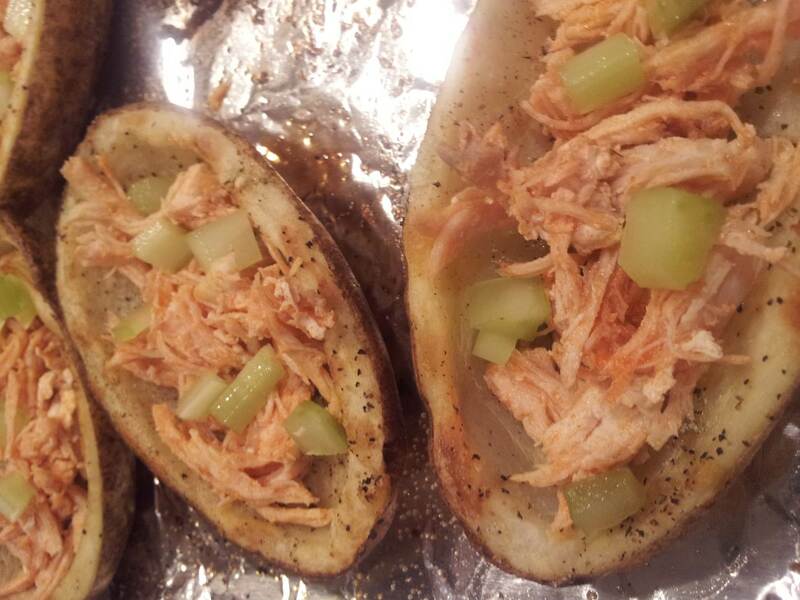 Add your shredded chicken and celery. Then add about 1/2 Tbsp. 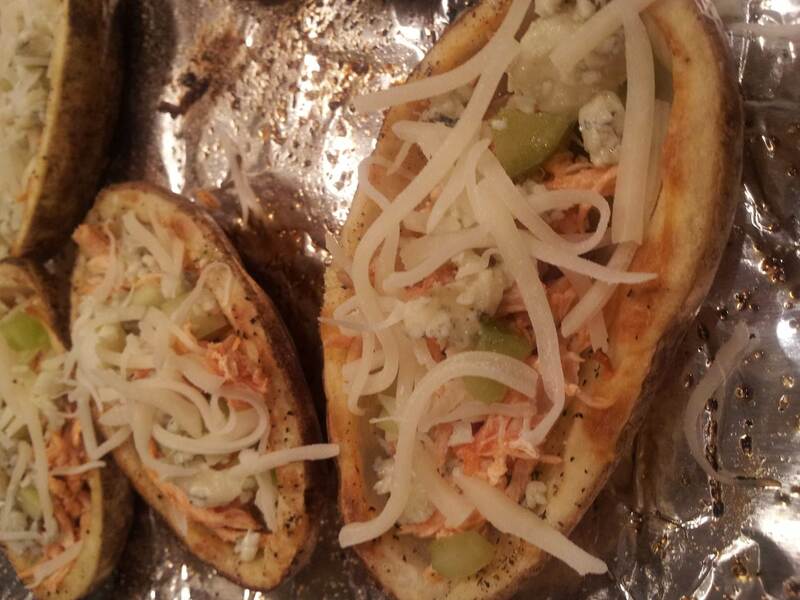 each of blue cheese crumbles and shredded mozzarella. Return to oven for 5-7 minutes until cheese has melted. Remove and drizzle remaining 2-3 Tbsp. 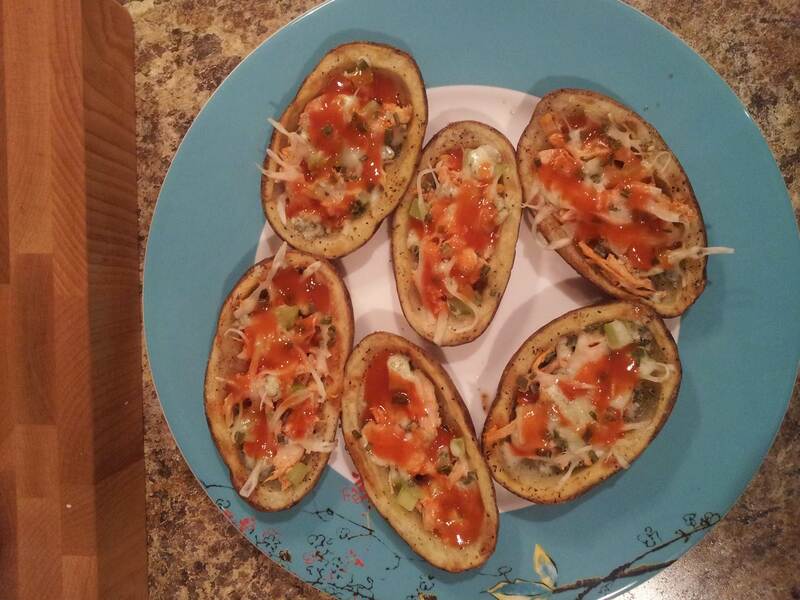 hot sauce on potato skins. I also sprinkled with some dried chives due to lack of green onion, but that’s up to you! Serve with some fat-free Ranch dressing for dipping and devour! Try them while you’re rooting on your team this weekend…you won’t regret it! 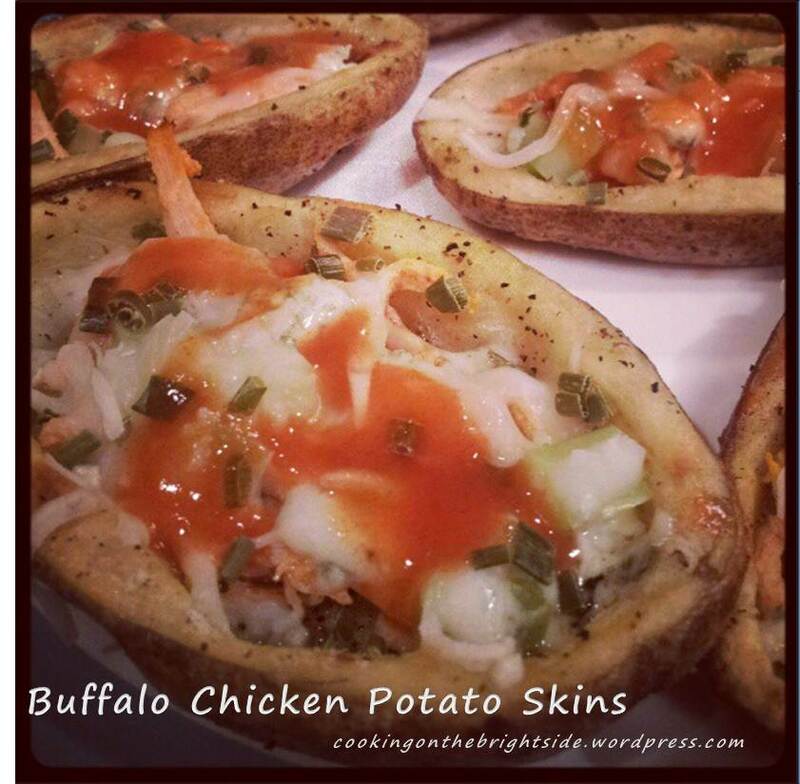 This entry was posted in Appetizers, Bites, Chicken, Main Courses and tagged buffalo chicken, buffalo chicken potato skins, healthy potato skins, healthy snack, healthy Super Bowl, spicy, weight watchers appetizer by cookingonthebrightside. Bookmark the permalink. Oh boy, these look fabulous!!! Wish I had some potatos right now.